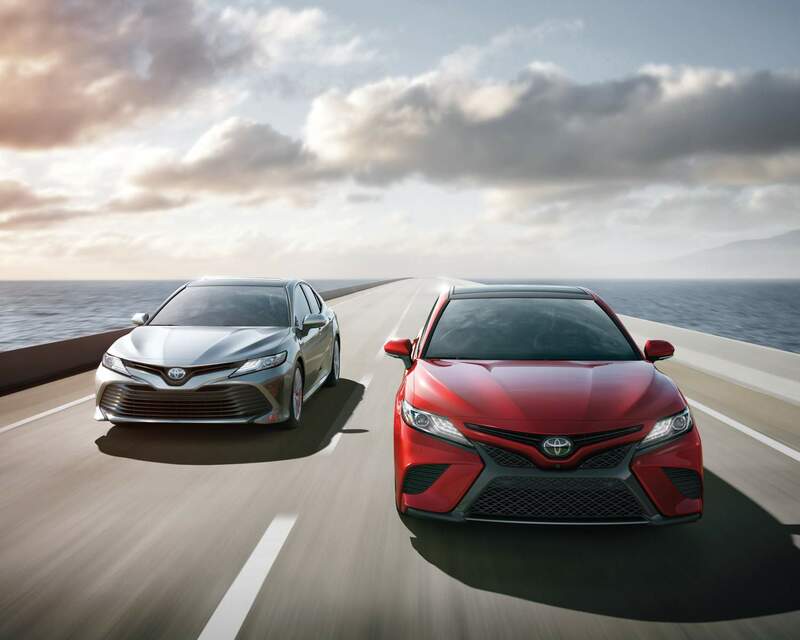 Engage with a fresh perspective on performance in the incredibly innovative 2018 Toyota Camry Hybrid. Through four doors and seating for up to five individuals, this vehicle takes you out of the ordinary and into a realm of power and capability that utilizes efficiency like no one else. Available trim levels include the LE, SE, XSE, and the XLE. On the inside, the 2018 Toyota Camry Hybrid presents you with a luxurious oasis where driver needs are put at the centre of the design. An ergonomic layout is accentuated by details such as illuminated entry and available leather door trim. Fight off the temptation to stay in as you enjoy the comfort of heated front seats. Furthering this comfort is an available 8-way power adjustable driver’s seat, ensuring that you are perfectly supported throughout any length of journey. Place your hands on the available leather-wrapped steering wheel with mounted controls as you access your settings without distraction from the road. Utilize the dual-zone automatic climate control to provide accommodating temperatures as it allows you to set and maintain two different front climate zones at once. 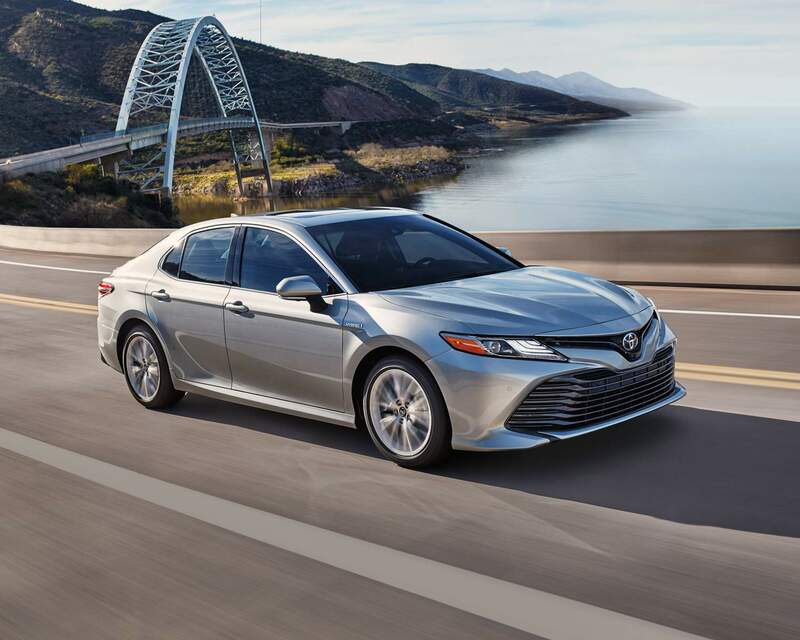 The exterior of the 2018 Toyota Camry Hybrid is rich in modern details and advanced features. A sweeping body profile is enhanced through the available rear spoiler and increased aerodynamics. Draw inattention through accents such as the optional chrome exhaust tip, while the optional Adaptive Front Lighting System with Premium LED Headlamps brightens the road ahead in a range of conditions. Bring modern technology into your everyday routine with the 2018 Toyota Camry Hybrid. You are given a 10-inch Head-Up Display, providing important information just above the dashboard, making it effortless to keep your eyes on the road. Communicate with the outside world with ease as you take advantage of hands-free calling and an optional 8” Display Screen. No matter where you are headed, arrive with full battery thanks to the available wireless charging feature. As you drive the 2018 Toyota Camry Hybrid, you are able to reflect your personal preference through a series of Toyota Genuine Parts and Accessories. Increase protection with the available Pro Series Paint Protection Film or cargo liners as the floor mats deliver a cosy setting that also works to keep your interior clean and fresh. Raise your expectations as you drive the 2018 Toyota Camry Hybrid and tune into the remarkable power and efficiency in store. Through electric power combined with a 2.5 litre 4-cylinder engine with Atkinson Cycle timing, you are given greater horsepower and exceptional fuel efficiency. Drive with the astonishing responsiveness of the Continuously Variable Transmission as you put your faith in a battery that was designed to last the life of the vehicle. Toyota Star Safety System: Vehicle Stability Control, Anti-lock Brake System, Electronic Brake-force Distribution, Brake Assist and Smart Stop Technology. Engage with the driving experience you have been looking for with the 2018 Toyota Camry Hybrid. Combining a legacy of reliability with innovative technology and an alluring design, this is not your uncle’s Camry. Explore the 2018 Toyota Camry Hybrid at your local Edmonton Toyota Dealer – Gateway Toyota. Through its vast inventory of new and used vehicles, Gateway Toyota is here to help you find exactly what you are looking for.